It’s that time of year that some wait on pins-and-needles for… hatch chile season! The roasters are out in full force at several grocery stores in the area, and with a freezer full of chiles, I wanted to find a recipe off the beaten “green chile stew”/”green chile enchiladas” path. This recipe is adapted from Real Women Eat Chiles and has quite the eye-appealing presentation. Tilapia, catfish, or any other firm-fleshed whitefish is baked in a corn husk with freshly-cut corn, hatch chiles, green onions, and lime. Simple and delicious. I promise not to make any corny puns in this recipe review. I’m pretty sure that counts as one, so too late. Ah, crap. Oh well — so I was describing this dish to someone and he said it almost “sounds like a tamale”, which is exactly what it’s called in the book. “Sounds like a tamale” is a strange name for this recipe.. Okay, *now* who’s being silly? Yeah, you. No, it’s called “Tamale-style catfish”. Ah, because of the wrapping with the husk and steaming and such. Yes! Anyway, I think the presentation of this dish is pretty cool. Agreed — but don’t let that detract from the delicousness. I love the corn and hatch chile combo on top, and the fish is perfectly cooked. More than just a kernel of truth there — no dryness. That corn husk seemed to keep all the moisture in. You were just waiting to make a corn pun, weren’t you? Or a corn pone — yum! Carefully peel back the husk from each corn cob. You will use it for baking the fish. Cut the ear of corn off the stem just above the end of the cob, leaving the husk intact. Set the husk aside. 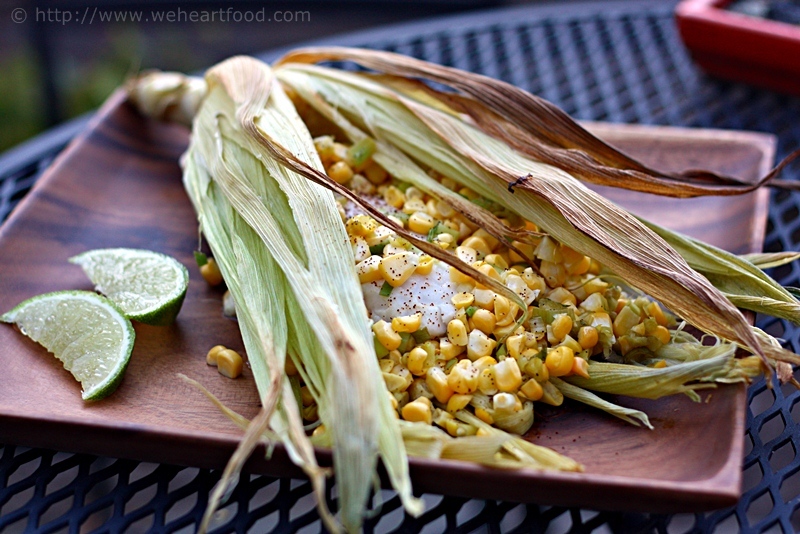 Cut the corn off the cob and combine with green chiles, green onions and the juice of a quarter of a lime. Rinse the fish and pat dry. Place one fillet inside each of the corn husks. Top each with one-half of the corn mixture and close the husks over the fish, overlapping slightly. Bake for 15 minutes, or until the fish flakes easily. Cut the remaining lime lengthwise into 2 wedges. Serve the fish in the husk with a lime wedge on top. I love when Lisa gets on a “I’m gonna bake treats” kick. This week she spotted this recipe @101 Cookbooks for a tasty coffee cake with an interesting twist — it includes fresh rosemary and thyme, which happen to be the two plants we’ve actually managed to keep alive in our garden. Perfect! It smells like you’re baking space cakes or something in here. Nice try — but not quite. Different herbs — rosemary and thyme. In coffee cake? What the? I know, interesting, right? But you have to taste this. Omigod this is awesome. It doesn’t really come across super-herby, but I definitely smell it. Why is the inside so yellow? Hmmm, not sure… the lemon zest? Don’t you love the crumble on top? So addictive! Are you sure this is just rosemary and thyme? This coffee cake totally gives me the munchies. Believe what you want — just save some for me! Preheat the oven to 350F degrees, rack in the middle. Butter a 1-pound loaf pan, and line with parchment paper. In a medium bowl, whisk together the flour, oats, baking powder, baking soda, salt, thyme, and rosemary. Set aside. In a separate large bowl beat the butter with an electric mixer until light and fluffy. Drizzle in the maple syrup and beat until well incorporated, scraping down the sides of the bowl as you go. Beat in the egg, lemon zest, and vanilla extract, scraping the sides again. Add half of the flour, stir, and just a splash of the buttermilk. Stir again, then add the rest of the flour and stir in the remainder of the buttermilk, until everything just comes together and then very gently fold in one cup of the blueberries. Scrape the batter evenly into the prepared pan and set aside. To make the streusel topping, place the flour, butter, brown sugar, rosemary, thyme and pecans in a food processor and pulse until the topping is just past sandy/crumbly, yet still moist looking. 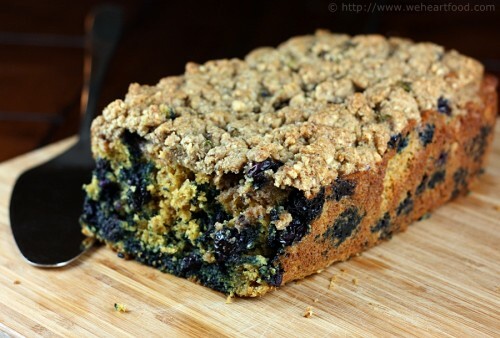 Crumble 2/3 of it over the cake batter, sprinkle the remaining 1/3 cup blueberries on top of that, and then add the last of the crumble. Delicately pat in place with your fingers. Place the coffee cake in the oven and bake for 45-50 minutes or until the top is golden and a toothpick inserted into the center of the cake comes out clean. Let the cake cool for five minutes and then remove it from the pan to cool on a rack. 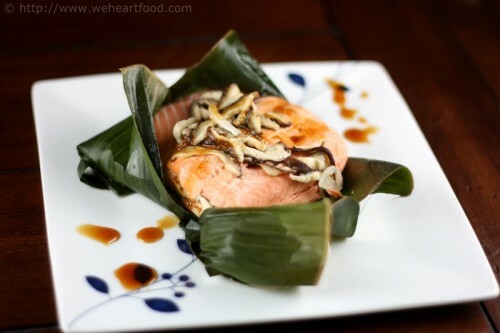 We had banana leaves left over from the Steamed Salmon recipe, and I happened to stumble across this tasty-looking pork dish a couple of days before a PEPS potluck, so it was a no-brainer to make it our contribution. 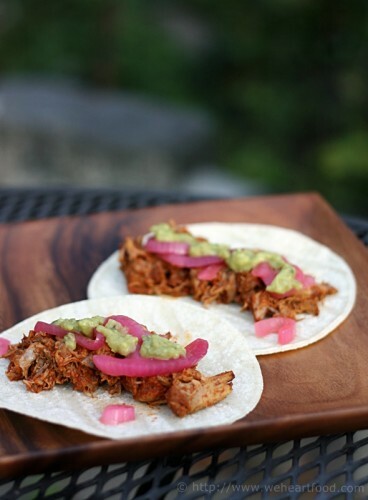 I’m still partial to the Carnitas that we’ve made a few times previously, but this recipe is easier, and actually tasted better the next day as leftovers. I love finds like this, that come out of trying to use up something we bought for a different recipe — banana leaves! I love recipes that list 20 cloves of garlic in the ingredients list. That too — between the garlic, citrus, and achiote paste, the pork has a pretty distinctive flavor. I really like it, it’s different. 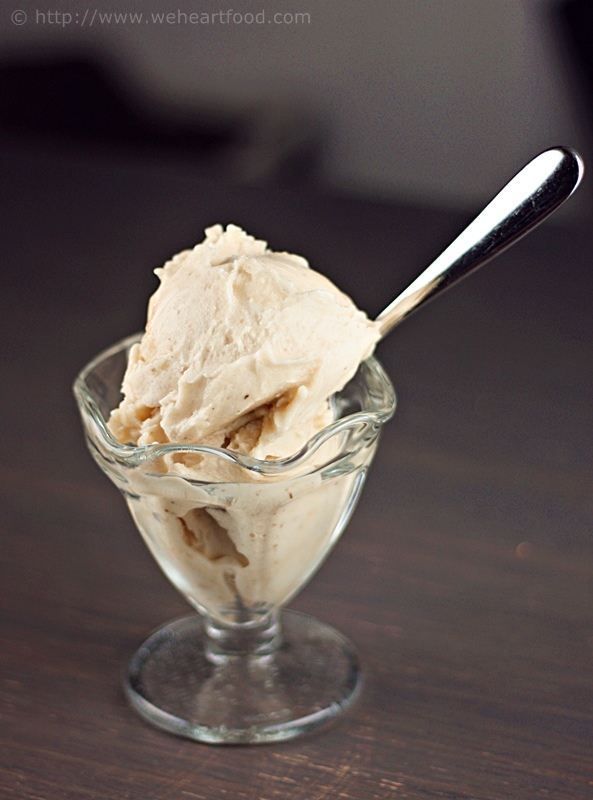 You’re right, it’s different and it’s delicious — so what’s the deal with the ‘real’ recipe? Oh, so traditionally you’re supposed to roast a whole suckling pig in a hole in the ground. Yeah, I thought you’d be fine with pork shoulder. Combine the achiote paste, garlic, lime juice, and lemon juice in a blender, and puree until smooth. Cut pork into large square portions, leaving much of the fat (you can always remove any fatty pieces after it’s cooked) cover with the paste mixture, and marinate in refrigerator overnight, 12-24 hours. Line a roasting pan with overlapping banana leaves, letting them hang over the sides. Put the pork and marinade inside, wrap the leaves over the top, then top more overlapping leaves on top to create a sealed package. You should also then line the roasting pan with foil to prevent steam from escaping. Cook 3.5-4 hours, until pork shreds easily with a fork. Serve in tacos with pickled onions (recipe here), guacamole, and a *very* spicy hot sauce.